How do you define success and what do you need to do achieve it? Get a clear, proven, exact explanation of how to ensure profit progression on this episode. Refine your strategy and make your business more successful. Learn more tips from the community now. Do the right thing. [Click To Tweet]. Build your solid foundation. [Click To Tweet]. NO to short-term focus. [Click To Tweet]. Next topic is strategy and mindset. And I’m going to lean on Peter Drucker here a little bit. 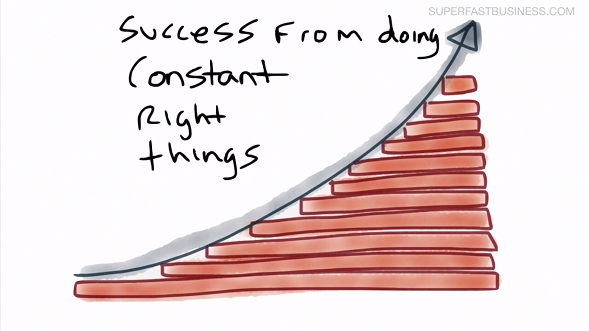 But as I’ve been refining my business and lifestyle mix, it sort of occurred to me that success is really about doing constant right things. It’s about adding the things that you’re doing and getting them right. Like in one layer, the bottom layer there, it’s about the baseline stuff like business development. And then the next layer up, it might be, now that you’ve got some leads coming in your work on your conversions. And then the next layer up it will be continual content creation pattern or routine or schedule. The next layer up might be adding some extra things like telephone numbers, shopping cart abandonment. And the next layer up will be to go and visit customers live or attend meetups. And the next layer up might be guest podcasts and stuff. So if you just keep stacking the right things on top of each other, then what you’ll find is once you’ve got your base layer, each time you stack, you don’t have to do a big thing for it to increase your sales or your profit a little bit more because you’re building on solid foundations and your business trajectory will go up. It’s when you chop and change or you do the wrong things such as short term focus or you start business development then you stop or you stop making content going forward, then your progression will start to ease off and flatten as well. So if you want to have a progression in your profit, then you need to constantly be doing the right things and stack them on top of each other. So get your baseline in place and then just keep adding the right things. And it goes without saying but I’ll say it anyway, remove the wrong things. Whatever you’re doing that’s wrong, you’ve got to stop doing that and you’re probably aware of some of them. That’s basically it.